Flattening the Earth so that it can be easily drawn on a 2-dimensional surface is complicated. Over many years map projections have been developed to aid in this process, but they can only really estimate (albeit very accurately) the shape and dimensions of things on the Earth’s round surface. Whilst it is important to understand the technical aspects of map projections, it is also worth considering the effects that such transformations can have on people’s view of the world. The image below shows an assortment of map projections of the UK (and one of Great Britain). These have all been taken from Wikipedia so the level of detail along the coastline varies a little. They demonstrate nicely the effect that different map projections can have on the shape of a country. As you can see, some of the projections have squashed the UK whilst others have stretched it or changed its orientation. The British National Grid is the best representation because it has been designed specifically for Britain. It is the projection you will see used on Ordnance Survey maps and therefore most printed maps of the UK (it is rarer to find it online). Whilst excellent for Britain, the National Grid projection does not work on a global scale because it would cause massive distortions to the other countries. Instead, we should apply global projections, which need to be chosen carefully depending on their purpose and the scale of the map being produced. A poor choice of projection can have significant consequences because the relative size of a country on a map matters. Perception of country’s size is a delicate issue: in international politics, for example, countries which appear small on the map fear being overlooked. Indeed, this has long been the argument against the commonly-used Mercator projection, especially with reference to Africa, which appears relatively small on maps of this style. This effect is seen in Kai Krause’s “True Size of Africa”. However, even this map has been criticised for using an inappropriate projection. 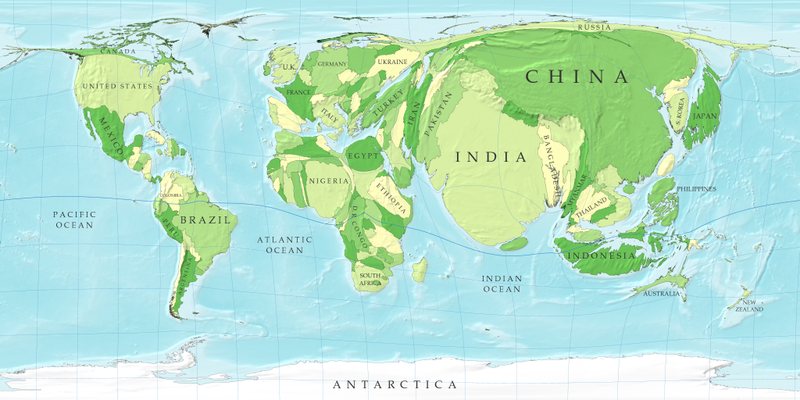 The Economist, for example, responded by producing a map that maintains the correct relative areal proportions between each of the countries included (with Gall’s Stereographic Cylindrical Projection). Nonetheless, both maps illustrate the way in which our perceptions of this vast continent have been altered by “mainstream” mapping practices. If you are interested in where people live, then the above picture may also be misleading. It is possible to alter projections so that the size of the country on the map is influenced by its total population. It is clear that cartographers can produce different views of the world. We, as informed consumers of maps, need to be aware of this, to think twice about what we see and to consider how the information would look if projected differently. More importantly, by asking why the cartographer chose the projection they did, we may even be able to learn something beyond what we see on paper.